It's not often I see a photo of a plated dish on my Facebook 'newsfeed' and think: "Hmmm, I'd like to recreate that!" That's because - and let's be frank here - the majority of social media 'foodie' pics are nothing more than something that looks slapped together (even if hours were lovingly spent on it) and hastily snapped on an iPhone. This does not instantly make you a cooking expert. It might be delicious, but inspiring, it ain't. So I was delighted to start seeing beautiful photos from one Mr Paul Hayes in my feed which I thought were simply cut and pasted from a food blog. The accompanying recipes on his blog are simple, easy to follow, and utterly enticing. And in this instance, they're not penned by a novice writer - instead, Paul is an ex-editor [we used to work together!] and fulfilling his long-time passion for cooking is something he has now decided to document. Lucky for us! "I love cooking for one person and, luckily, that person is me. Having said that, I spend a lot of time cooking and eating with other people and, ironically, it's the friends who have pulled up a stool at my kitchen bench over the years who pushed me to write down what amounts to three decades' worth of recipes and food ideas that work for one person. That's how 'A Table for One' was born. "I like to take a realistic approach to cooking. We all have to work, and we all have to eat. It's not a competition, and we shouldn't be trying to produce restaurant food at home. That's what restaurants are for. Like the other necessities, clothing and shelter, food is subject to fashions. It won't be long before we see quinoa on a gluten-free cupcake that somehow counts as "paleo", "clean" and "molecular". Enough. "For me, time spent in the kitchen is not a chore. After a day parked in front of a computer, the pleasures of the kitchen are very welcome. Making something to eat reconnects you to your senses, your body and the seasons. Sometimes it's a quick snack or something speedy before heading out the door again; other times it's comfort or indulgence or a mellow, slow-cooked dinner. A Table for One will, I hope, give you ideas that make your life easier and more pleasurable, and celebrate your independence. I use everyday ingredients and simple techniques without any fancy equipment - perfect even if you think you can't cook. And scaling up for two or more is easy. "I hope you'll visit A Table for One, where I'm sharing recipes, ideas and inspiration. You can also have new posts delivered directly into your social feeds by following on Facebook, Twitter or Google+. Just for readers of Josie's blog, I'm sharing a super-easy weekday wonder, grilled lamb with chilli jam. It takes only a few minutes to make but packs some serious flavour, and it easily scales up for more than one, as you'll see. After trying dozens of brands, the chilli jam I use is one by Beerenberg Farm. (I'm not being paid. I just like it.) It has a great balance of sweetness and heatness and – parents, please note – it's mild enough for children. Actually, the kids I know love it. Of course, if you already have a favourite, go with that. 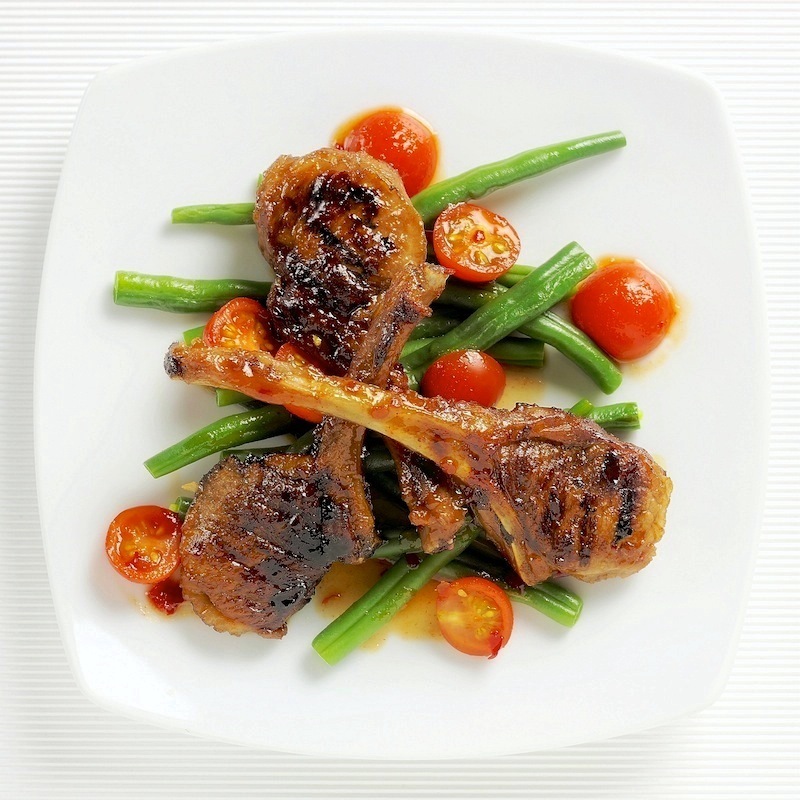 Lamb cutlets change size depending on the time of year. Here I used fairly small ones; adjust the number you use according to the season and how ravenous you feel." • Heat a frying pan over medium-high heat, and get your water on for steaming or boiling for the green beans. • Heat a little olive oil into your pan and cook the cutlets for 3 minutes a side for medium-rare, a minute longer if you prefer well done. Remove them to a plate to rest, loosely tented with foil. Turn down the heat to low. • Turn your attention to the beans. Whether you're steaming or simmering, they'll need 3 minutes. • Pour the rice wine or mirin into the frying pan you cooked the lamb in. Stir in the remaining spoonful of chilli jam and cook for a few moments until it thickens slightly. Add the cherry tomatoes and toss. • To serve, plate the beans, add the tomatoes and lamb and drizzle over any remaining sauce. I am trying out this recipe, pronto. Although these recipes are intended for one (or more, just increase the quantities), I am sure I am not alone when I reveal that sometimes, I like to make something just for me, separate from what I have prepared for my kids and husband. Make sure you follow Paul on his social media networks highlighted above, for more recipes.